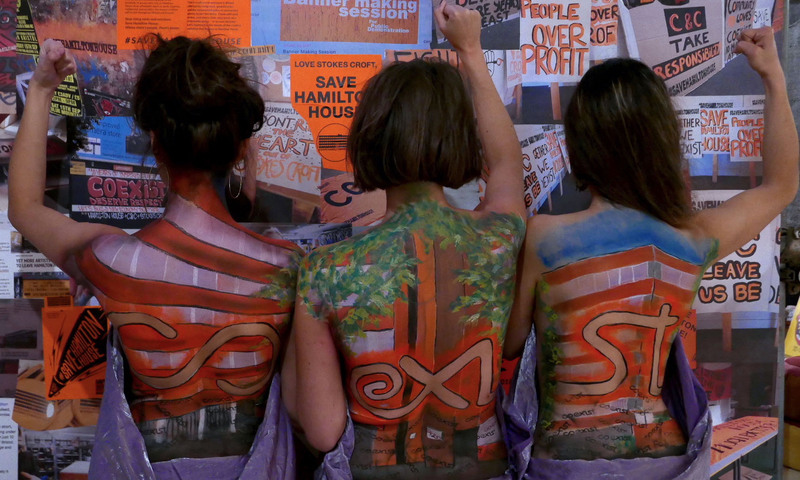 Coexist, the non-profit social enterprise who has managed the iconic community hub Hamilton House for the past ten years, has today been given one day’s notice to end their tenancy by their landlords, Connolly & Callaghan (C&C). This would effectively end their income and potentially force the organisation to close. This development comes after eighteen months of tense negotiations between the community group and their landlords who plan to develop the building into flats – despite massive opposition from the local community. Former investment banker Gavin Eddy has been working closely with C&C to enable the takeover – conducting an ‘independent review’ of Coexist last June on behalf of C&C, before announcing what has been described by Coexist directors as “a forced takeover” of their business. As an organisation whose main concern is to serve the community, Coexist CIC wishes to uphold its values and has therefore decided to challenge what they consider to be a non binding tenancy at will. Coexist Co-Director Danny Balla said: “We would firstly like to thank C&C for their support over the last ten years. This project began with an invitation from the late owner Martin Connolly to form a Centre of Excellence in Sustainable Communities. Over the last decade we created a thriving cultural and community hub, which at its peak served over 500 artists, social enterprises, charities and small businesses, had over 10,000 weekly visitors and collectively generated over £21m per year into the local economy. However, C&C’s recent actions and behaviour cannot be ignored for the damage it has inflicted upon staff, the internal community of licensees, social enterprises and charities. People and their businesses have been misled, lied-to, and now C&C are taking over the business we have developed over 10 years. This is unethical and is an attack on social enterprise in the city. Coexist believe that they are entitled to one month’s notice, and have decided to challenge the day’s notice provided to them. This perspective has been reinforced by a recent anonymous donation to Coexist’s Charitable parent organisation to ensure it has the ability to seek legal expertise if needed. Following a huge groundswell of public support and a recent march which saw over one thousand people take to the streets in support of Coexist, the social enterprise is confident that the right course of action lies in community ownership. Building on their identity as an organisation that operates to fulfil its core purpose and ‘best provide space for communities’, Coexist CIC is not just making a legal stand, but also addressing the way private and charitable sectors interact with one another. Coexist are regarded as ambassadors for community rights and, by taking these steps, they may be paving the way for a broader movement to safeguard community spaces on a wider scale.